We’ve all heard that Mary Kay is for some, and not for others. That you won’t know unless you try. That it’s your business and you make the decisions. That some will, some won’t, who’s next. That you control your own time and earnings. That you can just give Mary Kay a try for a low, low cost, and if it’s not for you, then you haven’t lost much. That your director will support you in whatever way you want to work your Mary Kay business. Until you decide to quit. No one is really supposed to quit Mary Kay. I think Mary Kay is like a cult. When you want to leave, they make it awfully hard. And if you do escape, they will shun you and tarnish your good name. Your director – – who pretended to be your friend while you were ordering products – – will suddenly turn on you and urge everyone to stay away from you. Why? Because you have become a liability. You are now a risk. You have become enlightened, and she is deathly afraid of you sharing your knowledge with other unit members. Quite simply, every bit of decency and Christian thought and actions go out the window once your sales director realizes you’re serious about quitting Mary Kay. You have just crossed the pink line, and you must pay! Now by know I’m sure that you have heard that ******** has decided to leave our Unit and Mary Kay. I am sure she had very good reasons for this decision although she has not spoken to me personally about these reasons. Preferring instead to do it through emails. We need to make sure we make her team members feel welcomed within our ranks as I’m sure they feel abandoned by her. This being said it would be in your best interest to not have any contact with her for the time being. She would only be a negative impact on you. If you feel you need more information I will be glad to talk this matter over with you in person. Remember I am not only your director but your friend and we should be able to talk openly about what ever issues we have. Really? You can’t just wish her well with her decision? You can’t just accept that Mary Kay is not for her and she tried but now she’s done? You can’t give some sort of broad positive statement about her, and encourage the unit to continue to work? You have to be negative and encourage the unit to shun her? You disgust me, Mary Kay sales director. My Director hasn’t spoken to me once since I left, and I’m sure she’s told my unit to ignore me. Not one of the ones I was “close to” has reached out to me. If MK was really about enriching lives, wouldn’t they continue mailing Christmas cards to me and wishing me well? Oh well, I guess the karma is setting in on that one because she’s in the same title she was in years ago and has lost her Cadillac. It is a clear tactic, in Mary Kay, to avoid anything that could even just a little be construed as negative. Any criticism of any kind, any trouble, disappointing results, low sales, no shows, etc are all to be hidden from the group. So if only imagined success, wishful thinking, claiming and believing are expressed within the group, then each individual is left wondering what is wrong with them for their lack of appointments, sales, guests, or recruits. Then, if you express those things, you are shunned, rubber chickened, ostracized. There is no doubt that this is cult indoctrination and once you wise up to it, you have to be expelled from the group or you’ll poison others. You are either “in” the PINK or a threat to it…no other choices. Yes. Notice the key words used by MLMs are usually subjective. Question: Why doesn’t MK track sales to non-affiliates? Is it true that 99% of MLMers don’t make money? Answer: Don’t ask “negative” questions. You sound like a “hater”. Don’t you want to be “successful”? What are your “dreams” for your family? “Trust” in “God”. Giving a factual and statistical answer would cause the MLMing company to self destruct. Oh I trust in God. I really do. Oh Raisinberry. My heart is broke. Somehow. Knew all this, I’m a retired teacher. The last time I went to a meeting, I stood up and embellished and lied like a dog. I just can’t go back. I’ve been in for 4 years but refuse to go any further than an ibc. I make very little on a lot of sales. I work my arse off to do it. Sight owner please edit out my name. 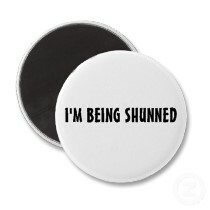 Shunning does two things – it tries to punish the shunned and it prevents the rest of the group from bolting. I would really love to ask some SD, “Well, who IS MKult for then?” If it’s not for everyone, then the they should be able to tell me who it’s NOT for… they don’t have a script for that. Notice you have to speak to the SD in person… nothing in writing. Plausible deniability for defaming former MKult escapee. Truer words have not been spoken. I was in MK for almost 16 years when I left “cold turkey” during DIQ back in 2013. I didn’t like what I saw/heard as I moved up the path. Imagine the complete & utter shock to my team & fellow unit members when I left. I wrote my reasons in a friendly & professional email. My director then learned to “bcc” on her emails. :). Many returned product & others went back to personal use. My reasons were “mine”, but I was glad to see others leave the cult. Needless to say, it caused a tremendous ripple effect that my director has never recovered from. She’s paying major co-pays to keep up appearances. Funny – we were friends for 22 years before I left & she has not said one word to me since. Disappointing, but not surprising. Thankfully, a few have remained good friends. My unit production plummeted after I resigned, and my Sr Director has never made what she could’ve off my unit. It used to hurt me, but then I realized I was actually the one who won in the long run and not her.